There are many ways to construct an affordable, ecological, comfortable and autonomous house on your own piece of Motherland. A completely environmently-friendly house that gives total autonomy, that is easy to build and supplies the inhabitants with free energy, heating, water and food, exists already for 20 years and has proved its merits succesfully. 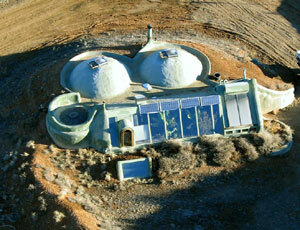 An Earthship is an easy to build, autonomous and self-sufficient house made out of recycled materials. It is not connected to sewerage, water or electricity networks because it supplies itself with energy (solar panels, wind-energy), water (stock and purification of rainwater) and also desposes of its waste. In the greenhouse in front there can be grown vegetables. The free building-materials are among others: car-tires, tin-cans and used wood. By filling the tires with earth, putting them on eachother and plaster them a very solid, safe and warmth maintaining construction is created. An Earthship and its inhabitants will interact with their environment and natural phenonemons creating a bond between man, house and nature based on respect and harmony (interfacing). 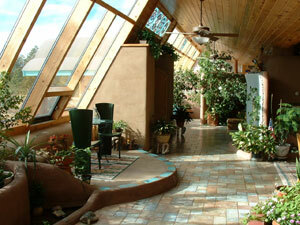 Earthships unite unmistakable advantages that give an atainable solution to problems concerning environment and energy. The Earthship concept was developed by architect Michael Reynolds and at the moment already more than 1000 Earthships are build in various countries and climate zones. Autonomous: independent of external energy and watersources, does not support multinationals. Envirormently friendly: uses pure natural energy-sources. No pollution: waste and used water is purified or re-used. Reclycling: existing materials are being re-used, there is no wastage. Ecological: here is no waste nor pollution nor abuse of the Earth. 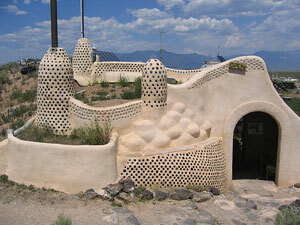 Creative: it is fairly easy to build and every Earthship is an unique creation. Cheap: the building (material and labour) as well as the energybills is low-price! Assessible: brings the ownership of a house within everybodys financial and creative possibilities. Self-sufficient: growing your own crops in and outside of the Earthship. Interfacing: the balance between man, house and environment: interacts with the surrounding nature. Esthetics: harmoniously imbedded in nature and build in organic shapes. Challenging: a 'living' house requires a new way of living. Earthing: cosy and close to the womb of Mother Earth. Quality of life: invites for a less stressfull way of life and a deeper contact with nature. An Earthship does not destroy our biotope but on the contrary returns something and cures the planet. There does not have to be any loss of luxury and comfort: depending on the need and possibilities it can be made as luxurious as you like. Rivendell wants to create possibilities and make concrete steps to build a community of people who build and live in autonomous Earthships. Solarhouses build of recycled materials and independent of the existing infrastructure (like Earthships) are a sure way to reduce the energybills and pollution. 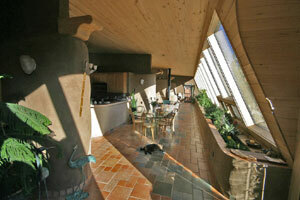 The Earthship is specially designed to reduce the destroying impact of the mainstream building schemes. The high cost and ecological stress of conventional building can be drastically reduced. 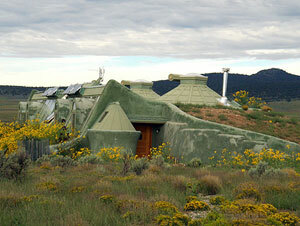 More detailed information on Earthships can be found in this file (Dutch pdf file, 37 pag.). 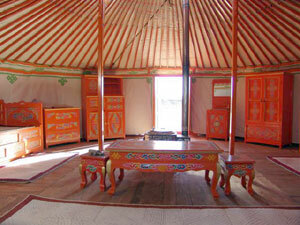 A Yurt of Ger is a Mongolian living tent traditionally used by nomadic tribes. 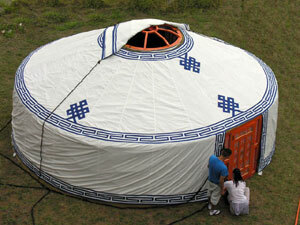 It is a portable and easy to assembe tent-house. Traditionally the inner-space is heated by a central woodstove. A Yurt is a big round tent made of felt with more or less vertical walls a massive wooden door and a round opening in the roof. The frame is made out of fine wooden skelleton existing of walls, roofpoles and a central crown whereby the smoke gets out and the light gets in. The wooden frame carries a thick woolen felt. The felt is waterthight. Usually on top of this an extra watertight canvas is placed. These canvasses are sometimes painted with motifs. Because of the ingenious construction it is possible to raise the tent without tent-pegs. Its strength and sturdiness is derived from the combination of wood, felt and belts. When there is a storm the yurt is secured by extra weights. 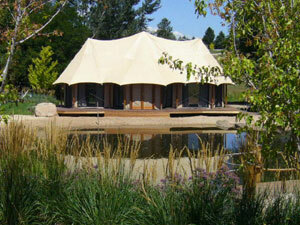 A Yurt is built to handle big changes in the temperature. This could mean minus 50 till plus 50 degrees celcius. It is relatively light and thereby it can easily be transported by horses, camels or with a big car. 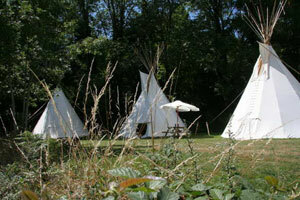 A Tipi is a coneshaped tent that- contrary to the wigwam- is not covered with bark but with animal skins or canvas. It is a typical native-american tent. 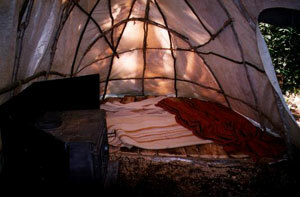 A Tipi exists of a frame of wooden poles, a cover of canvas or skins, an innerlining and a door made of canvas or skin. 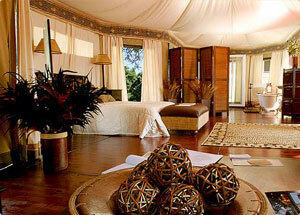 A living-tent is a modern version of the yurt but with a better, bigger and more comfortable interior. There are a lot of different possibilities and options to furnish or expand your living-tent (windows, terras, bathroom, kitchen, toilet,..) and make it as luxorious as you please. Light in weight and easily transportable. Relatively cheap and easy to maintain. 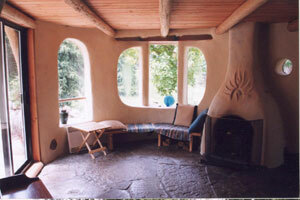 Ideal as temporal house during the construction of an Earthship or cobhouse. In the more luxurious models you can live quite comfortably for years. Earth is everywhere to be found, cheap and (mostly) free of chemical impurities. It is a natural building material. Cob has a strong moistregulating quality therefore a constant and stabile moistbalance is achieved. Because of the strong capacity for warmth-accumulation cob-walls ensure small temperature changes inside the house. Cob walls have a warm touch, charm and beauty which create a pleasant atmosphere inside the house. Cobbuilding does not require a lot of energy input and has virtually no transport costs (the materials are already there and almost ready for usage). Cob is not baked but dried in the sun which does not require extra energy. 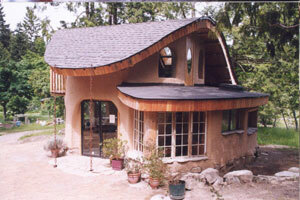 Cob houses are as durable and sturdy as stone houses and can defy the elements for ages. Cob is completely safe and chemically neutral therefore there never is a risk of poisening. Earth is one of the four basic elements (together with fire, water and air) and has a high spiritual energy: it is not a dead material but living an spirited. The materials for cobbuilding are perfectly recycable at all times and will never pollute the environment and they are also inexhaustibale there. 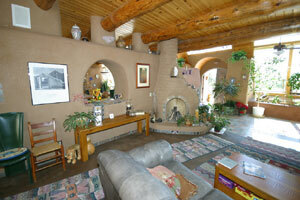 Cob can be used and combined with the construction of Earthships, strawbale houses or wooden houses.